The opening of The Bromley Room at West Village earlier this year has helped to keep those of us with serious Melbourne envy at bay. The Bromley Room brings a tropical edge to hidden laneways and hip warehouse spaces – quickly becoming our fine city’s most creative function room and event venue. 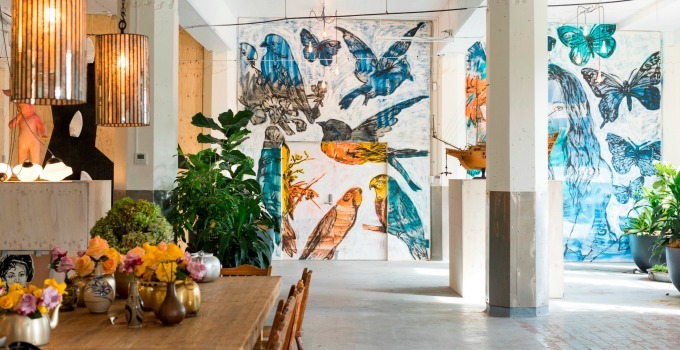 The New York-style warehouse is adorned with artwork by globally renowned artist David Bromley and his wife Yuge, creating a venue as beautiful as it is exclusive. Guaranteed to spice up any event, this stunning venue is available for hire, but only until the end of April 2018. Want to kick off 2018 in style? How about starting it with a big win? You and nine of your nearest and dearest could be treated to a decadent three-course private dinner in the glamorous space, booze included. Channel your inner gallery afficianado as you work your way through gourmet fare from Caxton Street Catering, and sip on premium wines and beers as you take in the ambiance. Valued at over $2000, you can’t afford not to enter this competition! With an opportunity to dine between the 3rd of January – 30th April, you’ve got to be in it to win it, so for a chance to feel like celebrity for an evening (and score serious points with your loved ones) head here to enter. Words by Emma Callaghan Keeping the G&G up to date with all the latest tasty tidbits requires a lot of double lattes and espresso martinis, so we occasionally need to give out some sponsored love. But rest assured that we only work with businesses that we think are really nifty, as the sponsor for this post is!